With its GeoAPI, Mixer Labs offers a database of some 16 million businesses and points of interest. Still, for some people, that’s not enough. They want to be able to add their own data to the database. And now they can. Starting today, Mixer Labs is rolling out a limited trial of new features that will allow users to add their own data to the database. This means that users will be able to create their own entries for places around the world to fine-tune location data as they see fit. For example, if you want to add a special overlay on top of a city for an augmented reality gaming application, you can do that now. This also allows you to make collaborative maps based on different user’s inputs into the database. But even more interesting may be the other data GeoAPI is now allowing developers to access. Mixer Labs will begin pulling in data from Foursquare, YouTube, and Weatherbug to help provide richer data to its developers that use its services. It’s now possible to look around a particular area and see the various services’ data points show up on the map. All of this is possible via those services’ respective APIs. The Foursquare data is particularly interesting as the service continues to gain momentum among users who check in to various places throughout cities around the world. In addition, GeoAPI also has a POI (points of interest) search that it is rolling out today. Mixer Labs is offering the first 50 developers that enter the code “GeoCrunch” to get access to these new features today. 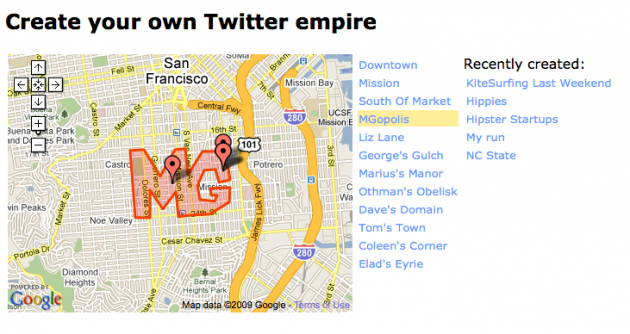 Update: As one of their examples, GeoAPI has created a region of San Francisco, dubbed “MGopolis.” Awesome. I feel like Daniel Day-Lewis in Gangs of New York.